We hear about a sea turtle, hopelessly entangled in the floating remnant of a torn fishing net; or seabirds that have starved to death in spite of having full stomachs: when we search the Internet for images relating to the index words ‘ocean litter’, we find the ugly side of global consumerism. The resistance of plastics to most forms of natural decomposition and other breakdown mechanisms makes their use for many applications of considerable interest, yet problems arise with their disposal. Conventional plastics barely decompose; instead, they remain in the environment for a very long period of time. For instance, a disposable plastic soft drink bottle can float in the ocean for up to 450 years, as shown by statistics published by the German Environment Agency (UBA). At best, only climatic influences and natural abrasion are able to slowly degrade these plastic materials. This then turns plastic ocean litter into microplastics or nanoplastics respectively (if the particle diameter is smaller than 100 nanometers). These tiny plastic particles can be found in beach sand, as well as in the open ocean, and—at this stage—with unknown effects on nature and man. 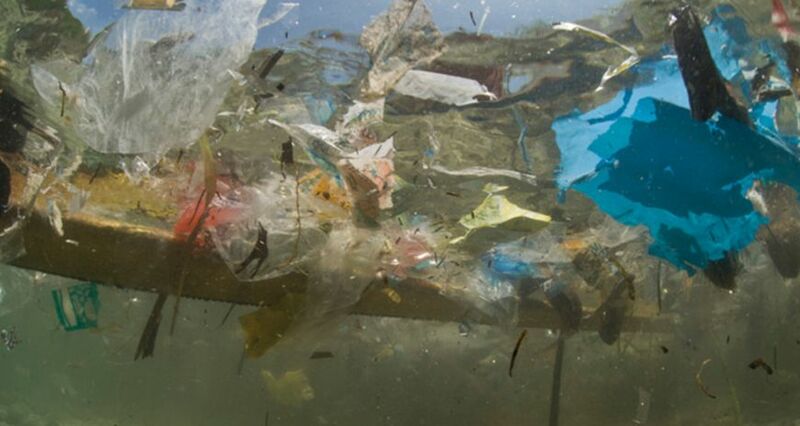 “Currently we know nothing at all where most of the plastic trash that has been dumped in the oceans is located,” explains Lars Gutow of the Alfred Wegener Institute in Bremerhaven. Together with his colleagues Mine B. Tekman and Melanie Bergmann, this biologist has started up the digital platform ’Litterbase’, where the results from 1,309 scientific studies have been compiled. Structured charts and graphic analyses, deliberately simplified, provide information about which type of litter has a particular geographic distribution, as well as which organisms are affected by encounters with these plastic litter components. Beyond that, this platform also shows the areas where most of the recent studies have taken place, as well as those, which have largely remained ‘blind spots’. “Other scientists can also benefit from ‘Litterbase’ since the information provided instantly indicates what further investigative efforts are required; similarly, journalists and those who are politically involved can also refer back to the ‘litterbase’,” Lars Gutow points out. While 70% of litter recovered from trawler nets in the North Sea comes from fisheries and commercial shipping activities, most of the oceanic litter—from a global perspective—has its origin on land. One of the centers of distribution of plastic litter is located in the Pacific Ocean. In the Southeast Asian region, as well as in other parts of the world, economic expansion and population growth exceed the existing transport and waste disposal infrastructure by a wide margin. Consequently, plastic litter is disseminated unchecked into the terrestrial environment, from where it is then redistributed by wind and surface water flow (rivers) into the sea. Through particular oceanic current flow and in the proximity of ocean eddies this leads to the accumulation of regular floating ‘plastic litter islands’ in the open ocean. Jenna Jambeck from the University of Georgia and her team have calculated that annually somewhere between 5 and 13 million tons of plastic litter enter the oceans. However, according to researcher Mark Lenz from GEOMAR Helmholtz Center for Ocean Research in Kiel, only about 250,000 tons are visible on the oceans’ surface. Where has the rest ‘disappeared to’? Scientists assume that, most likely, a large part of this litter will have sunk to the ocean floor. There, in due course, it is going to be blanketed by sediments, waiting to be recovered as bizarre fossils by future generations of man. The significance of this contamination of oceanic habitats by plastic litter so far remains unclear. We have animals that are being strangulated by torn rope and fishing net fragments, animals that feed plastic bags to their young or those that have become stuck in a mass of floating plastic shopping bags; but whether this has any effect on the population of particular species remains uninvestigated at this stage. The situation becomes even more difficult relative to microplastics and nanoplastics. For instance, these tiny plastic particles are being filtered out of the water by mussels, clams and small crustaceans, which then block the digestive system of these organisms. When they are subsequently eaten by other organisms, the ingested plastic material is being transported upward in the food chain, step-by-step. Nanoplastics even have the potential to penetrate body cells. “I cannot imagine that this does not have an effect on the ecosystem,” declares biologist Lars Gutow. However, there is no scientific data out on that yet, especially since plastic litter (apart from climate change, overfishing, and oceanic temperature increase) is only one of many stress factors with which organisms have to come to terms with. The effects that these foreign bodies in the ocean can have on the environment and on humans will emerge only in the course of time.